The picture is of a precious sister in the Lord, Lois. 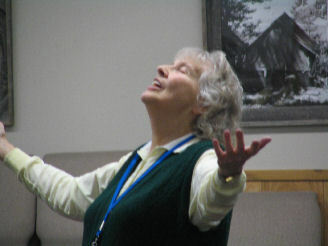 She is one of the people I have watched learn and use in her life the awesome Presence of the Lord. She has learned the secret. What you see in the picture is real. We often love the “feeling” of the presence of the Lord, without realizing its deep and intrinsic value for our lives. As we gather to worship, His presence is felt, is known and is enjoyed. This is wonderful. However, the work that Presence wants to do can most generally not occur in a corporate worship service. We can “feel” Him there, and learn what that is like, but what our hearts must have in order to change and move into healing, forgiveness, hope and life above our circumstances will not be known in the few times a week we might be with others to “feel” that blessed Presence. If we, however, are intent on Him, focused on Him, concentrated on Him and His word, we will find that same Presence meeting us daily in our time with Him, and it is there that over time wonders in our interior person occur. Recently I was struggling with an emotional response that I needed deep release from. I needed to not respond as I was responding, and to move into peace with the circumstance that was creating the emotional reaction. I had prayed, I had worked, I had repented (we often need to repent of our emotional reactions to people and events — must be another post — not this one). But it all seemed to no avail. Then I just reached to my Lord, and trusted His Presence to descend in manifest form, for He was really all I needed. What happened then was absolutely awesome. HE CAME! The Word says, “The one who has My commands and keeps them is the one who loves Me. And the one who loves Me will be loved by My Father. I also will love him and will reveal Myself to him.” John 14:21 (HCSB) It was marvelous. I have never in my life felt such peace and the situation in my heart was settled. The circumstance did not change, but I was changed. An impossible (in flesh) thing occurred inside me. I actually felt the movement inside and it was done and has stayed done. No new information was given to me, no new anything — just His awesome, marvelous Person in Presence form — a feel-able, knowable Presence. I want to encourage you to learn (as I am learning) to allow His Presence in that manifest form as promised in Scripture, to be a part of your daily time. Just think how He could and will change us in His glory. He so loves us.